Hello from New York City. I am surrounded by highrises and about to give you a little piece of sunshine. Just look at this picture and try to pretend it doesn’t make you happy. I accidentally got one of my feet in the first picture I took of this series and decided to take the rest with both feet in. It helps that this is positively my favorite thing to eat. I have made this recipe quite a few times, each time with the intention of making a lemon tart. 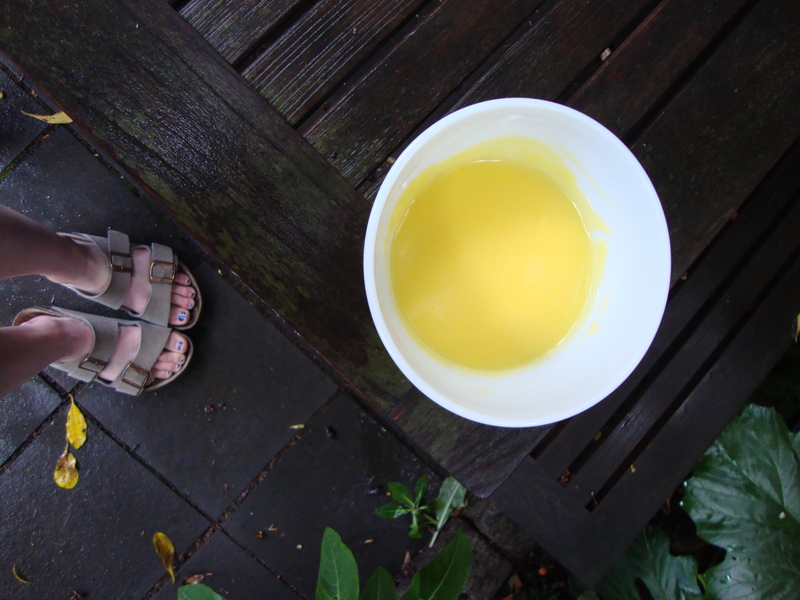 Somehow, the process never really gets that far along and I end up eating this lemon curd by the spoonful. Sometimes, I manage to save some to have on top of my toast for breakfast. But that’s as far as it ever gets. Maybe next time, I should think about making the tart shell first. But you and I both know that is never going to happen. Place a mesh strainer over a bowl, and set aside. In a medium saucepan, whisk together the lemon juice, sugar, egg yolks, eggs, and salt. Add the butter cubes and set the pan over low heat, whisking constantly until the butter is melted. Increase the heat and cook over moderate heat, whisking constantly, until the mixture thickens and just begins to become jelly-like. It’s done when you lift the whisk and the mixture holds its shape when it falls back into the saucepan from the whisk. Immediately press the curd through the strainer. Once strained, store the lemon curd in the refrigerator. It will keep for up to one week. You are currently reading De-tartified lemon curd (except amazingly tart) at Soufflé Days.